An Ohio professor finds answers to Great Lakes climate questions in an unlikely place – the rings of trees growing in the Pacific Northwest. 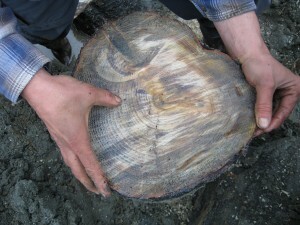 “We use tree rings to tell us how the past climate changed before written history,” said Gregory C. Wiles, professor and chair of geology at the College of Wooster in Wooster, Ohio. 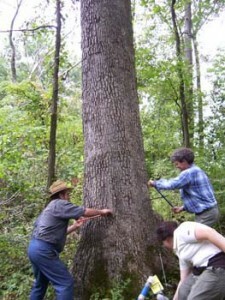 Tree rings, evidence of new growth in a tree, reveal more than just age. They show cycles of wet weather, drought and temperature changes. “What it comes down to is weather,” said Wiles, who also heads up Wooster’s laboratory on tree ring research. The laboratory develops the tree ring data into chronologies, which are used to detect a range of climate conditions. Last spring, Wiles and his graduate students put together a 265-year reconstruction of Lake Erie water levels published last March based on this method. A longstanding climate relationship between the Great Lakes and the Pacific Northwest explains how weather in the Gulf of Alaska, illustrated in tree rings, corresponds to Lake Erie water levels, he said. “What happens in one part of the world really does explain, in part, the changes that occur in the Great Lakes region,” said Wiles, who oversees several tree ring projects in Alaska. When there’s cooler weather in the North Pacific, lake levels tend to be higher, he said. The reconstruction shows Lake Erie has been higher in the past few decades than it’s ever been. The opposite is true when it’s warmer up north. “Looking in the past, the levels today aren’t that unusual – the ups and downs,” Wiles said. The connection could be key to what’s in store for the Great Lakes region. The laboratory doesn’t use the research to predict future water levels or climate conditions, but past cycles could be studied for that purpose. “The data gives us a wider window of opportunity of what it could be,” Wiles said. I’ve lived on Lake Erie all of my 50 years. It is interesting that you can correlate tree ring activity in the Northwest region with Lake Erie water level. Could further correlation be found with the aggregate water temperatures? This is just food for thought. You likely have already pursued this.